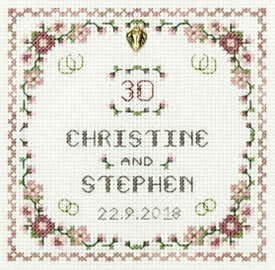 A cross stitch Window 30th Anniversary card cross stitch kit to stitch for a special Pearl wedding anniversary gift. A Window 30th Anniversary Card cross stitch kit for a Pearl wedding anniversary. Variegated thread is used to give changing colour in the border. The kit is coloured in dusky pinks with a joined hearts gold charm and gold metallic thread to add glamour. Variegated thread gives a subtle colour change in the borders. The kit includes full instructions for mounting the card and a clear chart. This 30th Anniversary card design is from the Decorative Textiles collection.